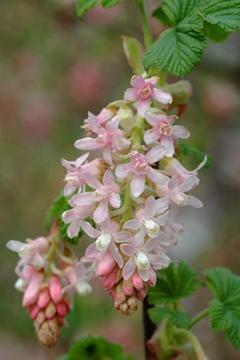 Drooping racemes of white flowers, flushed with pink, in early spring before the leaves open. The broadly lobed leaves have a pungent aroma. Any reasonable well drained soil, in sun or part shade. Prune after flowering, cutting back some of the older stems to ground level.